The ruling today, from the International Court of Justice, that Japan must cease its whaling in the Antarctic is great news for the whales. The fly in the ointment, isn’t there always one, is that the ban is temporary. The ban will be seen as a victory for the Sea Shepherd organisation, who have been a constant thorn in the side of the Japanese whaling fleet. Only earlier this month, there was a collision between Sea Shepherd’s Bob Barker and the Yushin Maru No. 3. There were no injuries, but both ships sustained damage. Though the ruling is cause for celebration, only time will tell whether the Japanese will comply with the decision of the court long term. It is also only a very small step towards the observation of the right of all living things to be allowed to live free and peaceful lives. The wholesale slaughter of cows, pigs, chickens and a multitude of other innocent animals continues unchecked. I’ve been out cycling this weekend, surrounded by beautiful nature and in the soft spring sunshine, just wonderful. In the practice of Nichiren Buddhism, we hold juzu beads in our hands while reciting Gongyo and chanting Diamoku. There are 108 beads in the main body, signifying the 108 Earthly Desires. The 4 smaller beads in the main body represent the 4 Great Bodhisattvas of the Earth … Jogyo, Muhengyo, Jyogyo, and Anryugyo. The 2 large beads at each end of the main body, are the “parent” beads. 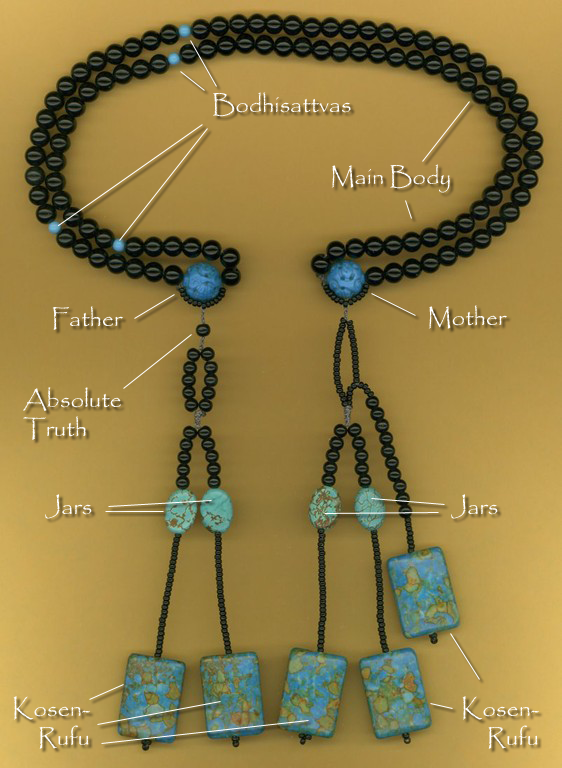 The “mother” bead, representing “mystic” is on the side with 3 dangles, and is placed over the middle finger of the right hand. The “father” bead, representing “law” is on the side with 2 dangles, and is placed on the middle finger of the left hand. We cross the beads in the middle, which shows our oneness with THE LAW. Also, we cross the beads so our benefits do not fall through our hands and lives. By placing the beads on our hands this way, we are accepting the reality that Buddhahood exists within our lives. When we press our hands together while we hold our juzu beads, our 10 fingers represent the 10 Worlds which fuse together simultaneously in the life of a Buddha, our lives. Our life is now one with the Mystic Law! The one small bead that sits below the “father” bead, represents Absolute Truth. Prior to Nichiren Buddhism, there were only 2 dangles on each end of juzu beads. The third dangle, consisting of 10 beads and a “Kosen-Rufu” bead, on the side of the “mother” was added, actually tied on, to signify Nichiren Buddhism and distinguish it from other Buddhist sects. On the remaining 4 dangles, there is a differently shaped bead part way down each string. This bead is called the “jar” bead and holds the benefits of our practice. The 5 larger beads at the bottom of each dangle are the “Kosen-Rufu” beads, and represent our desire to spread Nichiren Buddhism, Kosen-Rufu, throughout the World. My huge thanks are due to my lovely friend Lily Rose of Myoho Beads for researching the meanings of the individual beads and for allowing me to use her explanation. As Lily Rose says on her site, be careful buying juzu beads on line. Use this description or the juzu purchased in SGI bookstores as a guide. Make sure the beads you purchase have been created in an ethical and politically correct manner. Sorry to say, but many are not. If you would like to learn more about chanting, this link will take you to a very informative video produced by SGI. In case you were wondering, my CELTA course is going rather well, all things considered. Apart from the fact that I am really enjoying the whole experience, it’s a bit like Chinese water torture, the lesson preparation and assignments just keep coming. Last night was a little milestone on our collective path, half way through the sixteen weeks of study and a brand new gaggle of victims, or more properly, teaching practice students. A lovely group of people, all very keen to learn and very willing to be subjected to our formative teaching skills. As well as being a new set of faces, these students are still taking their first steps in learning English, as opposed to our previous charges, who were really quite fluent. So the challenges, on both sides of the classroom, were slightly different. There was more emphasis on keeping things simpler and checking that individual students understood what was being taught. The evening went really well. We were teaching them new vocabulary in the context of music, and they worked really hard. The highlight of the evening, for me, was talking to the oldest student, an 83 year old Middle Eastern gentleman, who was keen to tell me that he has been playing the violin since he was 7. He had the callouses on his fingers to prove it. It’s so interesting, meeting new people. People who have incredible stories to tell. None of this would have happened had I not made the causes. Karma is a wonderful thing. If you research Buddhism, you will find, as with Christianity, that there are many schools or sects, believing much the same basic principles, but with their own embellishments or focus. When I first became a Buddhist, I was rather naive about the different schools and followed the Kadampa tradition practiced at the Shantideva Buddhist centre in Maidenhead, later moving to Reading. Kadampa Buddhism focuses on the teachings of Geshe Kelsang Gyatso and the centre of the practice is concentrated on clearing the mind through meditation. The cause of much unhappiness and suffering is due to desirous attachment to property, people or situations, according to Kelsang Gyatso. The way to remove suffering is therefore to break the links of desirous attachment and accept the principle of impermanence. This is all very well in an eastern third world country, where possessions are few, life is lived at a different pace and everyone, or at least the majority, hold the same beliefs. Here in the west, where Judaeo Christianity is the predominant religion, Kadampa Buddhism only works if you can remove yourself from the mainstream society and immerse yourself in study within one of their centres. I also felt that the worship of gods within the temple was wrong. Shakyamuni was a man, he never proclaimed to be, or to be connected with, any deity. So where did all these gods spring from. I believe they are the manifestation of the metaphorical gods of The Lotus Sutra, made real by man’s need for a focus of worship. Not for me, this went against my atheist beliefs and lost the focus of the practice in my eyes. Over time I drifted away from the practice, and it was only when I was suffering because of the breakdown of my marriage, that I sought Buddhism once again. This time, I was lucky, or fortunate as we would say in Buddhism (not such thing as luck), to find Jason Jarrett’s podcasts, and through that, William Woollard’s Reluctant Buddhist. Immediately, the sense that my own life would be put back in my own hands, that belief was in the self and one’s ability to achieve Buddhahood in this lifetime, struck a chord. At last, a Practice that worked with real life, that answered questions instead of posing several more. A Practice that has helped me more over the best part of a year, than any other practice has done in the past fifty years. I wish I was like Ken, Jayne, William, Eddy and many, many others, who found Nichiren Buddhism ten, fifteen, twenty or more years ago. My life would have been completely transformed, and I believe, entirely for the better. There is a letter from Nichiren Daishonin to the wife of the late Matsuno, which describes how unlikely, and difficult it is to meet the Practice in a lifetime, it is well worth reading and explains just how lucky I have been to find my faith at last. That makes me sound like a ‘60s flower child, doesn’t it? I was a bit too young to really take part in the Swinging Sixties, with their free love, flower power and peace signs. It must have been a very exciting time, so much was happening, in so many ways. That’s how I feel about my experiences through chanting. The world is a much brighter, more enjoyable place to be and I really want everyone to share in those experiences. Of course, trying to explain in detail how Nichiren Buddhism can transform your life is not something you can do on the tube or in your local, uninvited. At least not without clearing the carriage, or the snug of the Red Lion, at one fell swoop. So with my slowly increasing self-awareness and understanding of karma and Buddhist principles, I am chanting more for others than for myself, for their health, wealth and happiness, and am always willing to discuss my practice if people want to hear more. I like the way this new world of Bodhisattva, well largely new to me, makes me feel, and I have this increasing urge to do things for others, rather than for me. What a wonderful world we would live in, if we all felt the same way.